Move over, Little Tikes Cozy Coupe; there’s a new ride in town! 2018 is an exciting year for fans of the Jurassic Park film series. It’s the 25th anniversary of the original Jurassic Park, and in June, the next installment, Jurassic Park: Fallen Kingdom, will hit multiplexes. To celebrate, Mattel is releasing a scaled-down replica of the Jeep Wrangler vehicle used to drive around the fictional theme park. 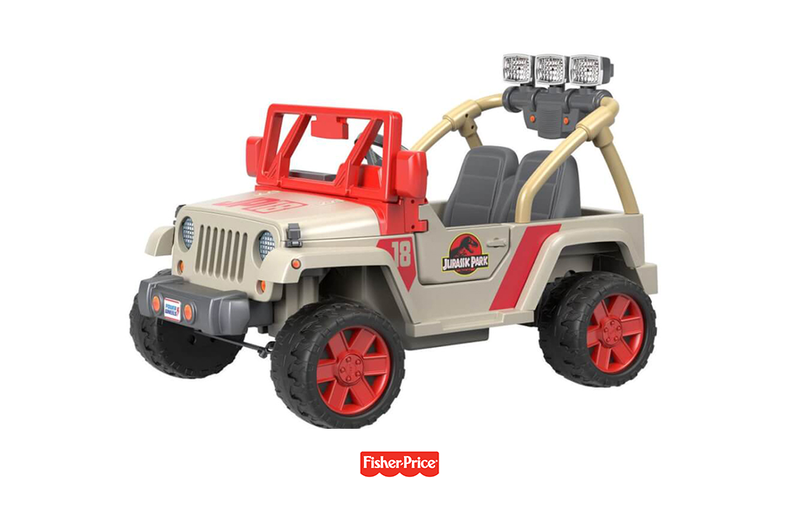 The battery powered Fisher-Price Power Wheels Jurassic Park Jeep is aimed at children ages five and up, with a 130-pound weight limit. The vehicle boasts a top speed of 5 mph forward, 2.5 mph in reverse, and can navigate over hard surfaces and grass – ideal to outrun a stampeding herd of Stegosaurs. The drivable Jeep sports Power-Lock brakes, has a working light bar, features graphics taken from the films, and emits “dino-chase sounds.” Rawr! The Jurassic Park Jeep will be officially unveiled at New York Toy Fair in February.